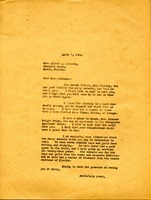 A letter from Martha Berry to Mrs. Albert Johnson after being told about her by their mutual friend Mrs. Yardley. Martha Berry mentions her niece, Mrs. Frances Wright Price, who lives in Miami. Miss Berry thinks Mrs. Price would be interested in meeting Mrs. Johnson. Martha Berry also encloses literature about the Berry Schools and mentions that they've had several students from Florida.